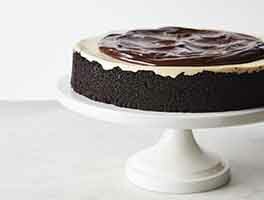 This straightforward chocolate cheesecake is everything you want it to be: rich, moist, dense, and hugely chocolate. Not only that — it's simple to put together, requiring neither special ingredients, nor a fussy water bath. If you're looking for a very rich (and very chocolate) dessert, you've found it. 1 hrs 20 mins. to 1 hrs 45 mins. Preheat the oven to 375°F. Lightly grease a 9" springform pan. Add the melted butter, processing briefly or stirring until the mixture is evenly crumbly. Press the moist crumbs into the bottom and partway up the sides of the prepared pan. Place the pan on a baking sheet, to catch any potential drips of butter. Pour the batter atop the crust in the pan. Place the pan on a baking sheet; this will make it easier to get the cake in and out of the oven safely. When you're baking the crust, as soon as you can smell a strong chocolate aroma, remove it from the oven; it's done. The crust may or may not have baked for 15 minutes, but the "aroma test" is a better indicator of doneness than the amount of time elapsed. 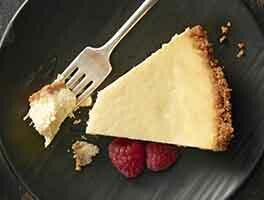 For a simple garnish, reserve about 2 tablespoons chocolate crumbs from the crumb crust, prior to baking. Sprinkle some crumbs over the top of each slice just before serving. I am wondering about the weight of the chocolate as I prefer to use high quality chocolate instead of chips? It looks amazing! Should I quarter it or reduced by two thirds for a 4 inch pan? All I can say is that I baked this in February for Valentine's Day and my family is still talking about it. It's April. I was "told" by one of my sisters that I will be making this again for Easter. Absolutely incredible. 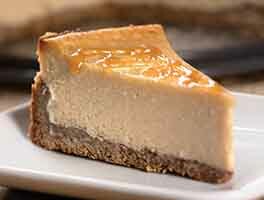 I have just made this cake and I found the baking time is 65 minutes at 375. But I had two issues - cracking of cake and slight depression in the middle of the cake. Not sure why except the comments of baking in a "bath" may eliminate the cracking. If that works, KArthur should update recipe. But the depression?? Hi there, Robert! We're sorry to hear that you had a bit of trouble with this recipe. 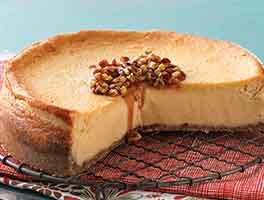 Most often when a cheesecake cracks on the top it is because of over-baking — when a cheesecake is done the center will appear a little soft and jiggle slightly. 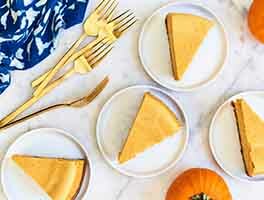 It can also be helpful to take the internal temperature of the cake, which should be 175°F about 1" from the edge of the cake. For anyone who wants to make these in muffin/cupcake pans, here's some timing and weights that might be useful. I weighed out the crust into muffin liners. They came out to 15-17g each (including weight of liner), which yielded 24 shells. This produces quite thick shells - mine came out practically equal height crust and filling which I personally like but might be too much for some. I baked the shells for 5 minutes. Then I baked the filled shells for about 16-18 minutes. They did crack pretty badly, but after they cooled, the filling collapsed a bit and the cracks mostly filled themselves in. I doubt it's worth using a water bath. My yield was 24 mini cheesecakes (standard 12 muffin pan), but there was extra batter, perhaps enough for another 6-12 mini cheesecakes. Next time, I will probably make the shells thinner (perhaps 10g crust + liner) and try for 36 mini cupcakes, which will hopefully use up the extra batter. I made this a few days ago. I made the cake batter then let it sit in the fridge until the following day when I was ready to bake it. I used mint oreo cookies for the crust and everyone at work said they loved it. They said the cake was delicious too and was completely gone! Thank KAF! I'm a cupcake girl. So, I make most of my selections into cupcakes. I used just a thin Oreo in the bottom of the cupcake paper (no need to do anything else to them, and they fit perfectly!). I fill the cupcakes to almost full, 3/4 or so. Bake for about 18-20 minutes. I brought them to the hospital where I work and they were gone in minutes. So good, and so easy to make, it's fool-proof! 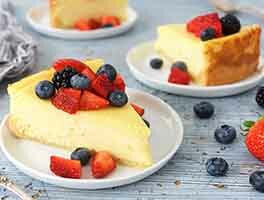 I've made hundreds of cheese cakes over the years, this recipe is just about perfect. Thanks KAF for all the great resources and recipes! Like Auro said, I substituted cocoa powder (Droste) for flour and I used gluten free chocolate sandwich cookies for the crust. I skipped adding sugar to the crust but did add butter. It made a gluten free dessert that was to die for! Thanks Auro for the tips. I made this recipe yesterday and I used the Philly reduced fat cream cheese and IMHO I thought it was plenty rich. I used a 9" springform pan it took a little over 60 minutes for the toothpick to come out clean. Overall, it was a very delicious dessert. I'll definitely do it again. This recipe takes much longer than the 1 hour 45 minutes. 30 minutes prep, 50 minutes baking, 60 minutes in the oven finishing, cooling on the rack and then in the fridge. That worked out to well over 2 1/2 hours from start to finish.